Education and biking – do they really go together? The simple answer is an unqualified YES! Info is key especially when you are trying to implement social evolution. So, whether it’s info on proper helmet wearing (which you wear any time you ride – right? ), how to adjust spoke tension (we all hate the rub, rub, rub of an out-or-true rim on the pads don’t we? ), good nutrition (both on and off bike) to the latest ideas on bike sharing programs and mixed vehicular use road ways – we’ll bring that to you here. 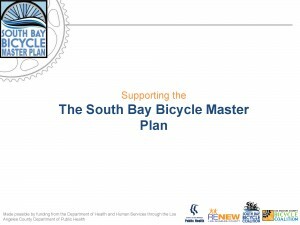 Since the core project of the SBC presently in the South Bay Bicycle Master Plan (SBBMP) we’re provided a link to the latest overview presentation here. Please click, take a look, digest and ask questions. Dialog is a good thing!